Helo! I would like to ask for some help in understanding how qualifications for Olympic men's basketball tournament at 2020 Olympics work. 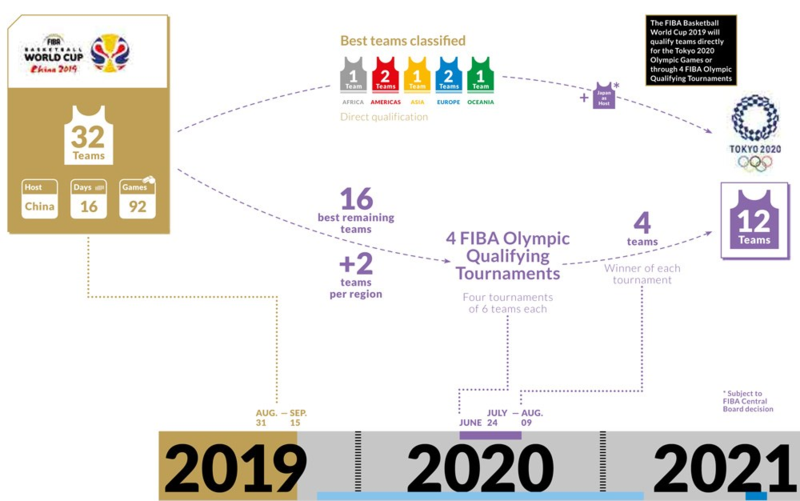 If it is going to be 4 wild card tournaments with 6 teams in each, how can they add additional 2 teams per FIBA region in addition to 16 teams from World Cup, because that gives the number of 26 teams? Please, could anyone clarify this a little bit more? Based on the 2019 World Cup qualifying, it looks like the Asia and Oceania regions are combined into one region, so there are only 4 regions for the purposes of the "+2 from each region" detail. So they take the best remaining 16 teams regardless of region, then the next best two teams from each region. Not the answer you're looking for? Browse other questions tagged basketball olympics or ask your own question.